Of the three main groups of food nutrients, we have long vilified fats the most. At 9 calories per gram, fat provides a hefty amount of energy that dieters may find difficult to use up. As a result, they end up residing on our growing waistlines as much-dreaded muffin tops and love handles. It does not help that fat lurks in so many of the tasty foods we love so much! And since there are many different types of fat, they appear in various forms in our diets. Hence, it is not difficult at all to exceed our daily recommended intake of fat. However, did you know that not all fat is bad for you? Taken in moderation, some types of fat have health-promoting effects, such as in helping the absorption of certain vitamins and minerals. So, what is the best type of fat and how can we incorporate it into our diets? Let’s discover which types of fat are beneficial for health and which types we are better off avoiding. You may have heard the terms “saturated and unsaturated fat” and even “monounsaturated and polyunsaturated fat”. But what exactly do they mean, and how does it affect the oils you use? The answer lies in the chemical structure of the fat molecule! Saturated fats do not contain any double bonds while unsaturated fats do. 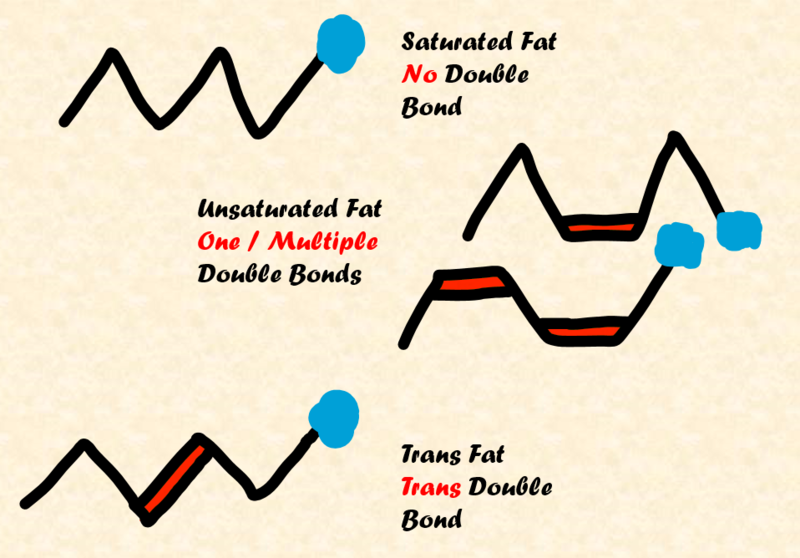 As their name suggests, monounsaturated fats (mono = “one”) contain one double bond and polyunsaturated fats (poly = “a few”) contain multiple double bonds. When exposed to high heat, the double bonds may become unstable and react with oxygen in a process known as oxidation and produce several harmful compounds. Saturated fats are usually solid at room temperature, and examples of cooking fat containing these include butter and coconut oil. 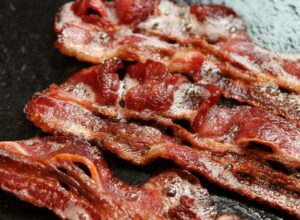 They are the main types of fat present in animal products – in meat, such as bacon and chicken skin, and in dairy products like milk and cheese. 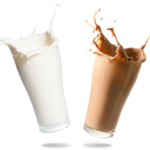 They have long been given a bad rep for being unhealthy for the heart – hence we are often advised to choose low-fat dairy options and limit our intake of fatty meat. Nutritionists recommend that we take in under 10% of our daily calories from saturated fat. Besides contributing to gut inflammation, too much saturated fat also raises total cholesterol levels, which may put you at risk of heart disease. On the other hand, replacing saturated fat with healthier unsaturated fat has been shown to have a protective effect. 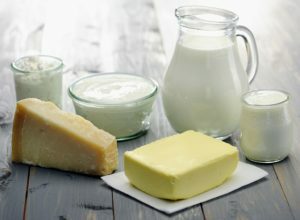 Check out our dietitian Bonnie’s blog post for a list of healthy butter substitutes. Unsaturated fats are liquid at room temperature. They are present in many plant-derived sources such as nuts, avocados and seeds. Taken in moderation, unsaturated fats are heart-healthy as they have been shown to raise “good” HDL cholesterol levels and lower “bad” LDL cholesterol. In addition, when found in their natural forms (e.g. nuts, seeds), they often come packed with fibre and many essential minerals! Oils high in monounsaturated fats include olive and avocado oil. These also happen to be excellent sources of vitamin E, an antioxidant which protects cells from damage by free radicals. Polyunsaturated fats can be found in most nuts and seeds, and also in corn, sunflower and soybean oils. However – a word of caution – when it comes to cooking, do consider that unsaturated fats tend to be heat-sensitive and prone to oxidation. Generally, monounsaturated fats are less susceptible to oxidation than polyunsaturated fats. 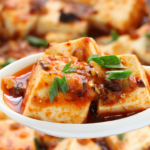 For this reason, it is better to avoid oils that are high in polyunsaturated fats, such as soybean, sunflower and corn oil for prolonged high-heat cooking such as deep-frying. For such purposes, olive or peanut oil makes a better alternative. Trans fats are unsaturated fats that are largely found in artificial forms, having undergone a process known as hydrogenation which artificially adds hydrogen to vegetable oil. This process allows the fat to be more stable, hence it is widely used in commercial food preparations. They are found in margarine, hydrogenated oils and many commercial products and fast food. Although these are undeniably delicious, trans fat is arguably the worst kind of fat for health. 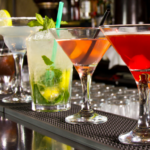 It is associated with heart disease, stroke and a whole host of other bad effects. Not only do trans fats raise the “bad” LDL cholesterol, they also lower the “good” HDL! Many reports also suggest that they cause inflammation and blood vessel dysfunction. To minimise our intake of trans fats, use butter instead of margarine and lower your intake of fast food and commercial baked goods. Look out for the words ‘hydrogenated’ and ‘partially hydrogenated’ and avoid these! These are also sometimes present in peanut, corn and soybean oils, so be extra careful and read your nutrition labels. There are 3 types of omega oils present in our diet: Omega 3, 6, and 9. You might also have heard them referred to by the terms linolenic acid, linoleic acid and oleic acid, respectively. Omega 3 and 6 are types of polyunsaturated fat while Omega 9 is the main type of monounsaturated fat we take in. We obtain the essential oils Omega 3 and 6 from our diet as our body does not make them. Omega 6 fats are abundant in the food we eat, coming from easily attainable and ubiquitous sources such as vegetable oil. However, in excess, especially when Omega 3 intake is lacking, they become harmful. Too much Omega 6 could cause high blood pressure and thus, we should limit our consumption of fried food. Recent studies have also shown that in our diets today, we take in much more Omega 6 compared to Omega 3 in an alarming ratio of 16 to 1. This stark imbalance, in fact, has adverse effects on our health. For example, it tips the scale in favour of inflammation, increasing the risk of cardiovascular disease. On the other hand, a diet balanced in Omega 6s and 3s reduces inflammation. Omega 3 oils have long been touted as one of the healthiest types of fat – and rightfully so! Studies have shown them to be anti-inflammatory, have protective effects and reduce the risks of cardiovascular disease. Fish such as salmon, mackerel and tuna, along with chia seeds and walnuts, are excellent sources of Omega 3. 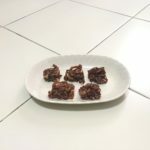 There are, however, 3 different types of Omega 3 oils – alpha-linolenic acid (ALA), eicosapentaenoic acid (EPA) and docosahexaenoic acid (DHA). EPA and DHA, which originate largely from fish, are more active in our bodies compared to plant-originating ALA. So, your best source of that Omega 3 goodness is actually fish! Oils that have excellent Omega 3 content include flaxseed, rapeseed and walnut oil. However, since Omega 3 and 6 are polyunsaturated fats, these oils are heat-sensitive and prone to oxidation, thus we should avoid using them for cooking. In fact, it is important to store them in the fridge as they are highly perishable. To reap the benefits of these oils, use them as salad dressings or drizzle them on food as a garnish! 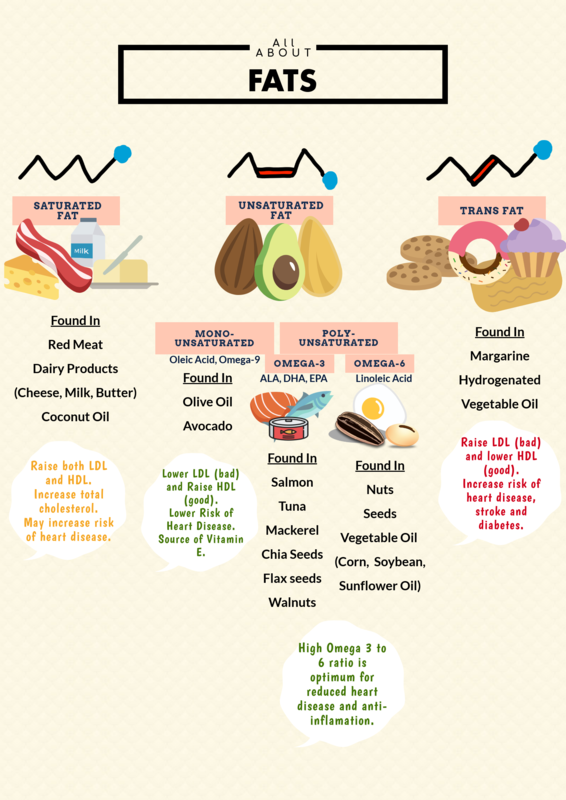 Hopefully, we now have a better understanding of the different kind of fats we see in our food. For a quick summary, check out the infographic below. 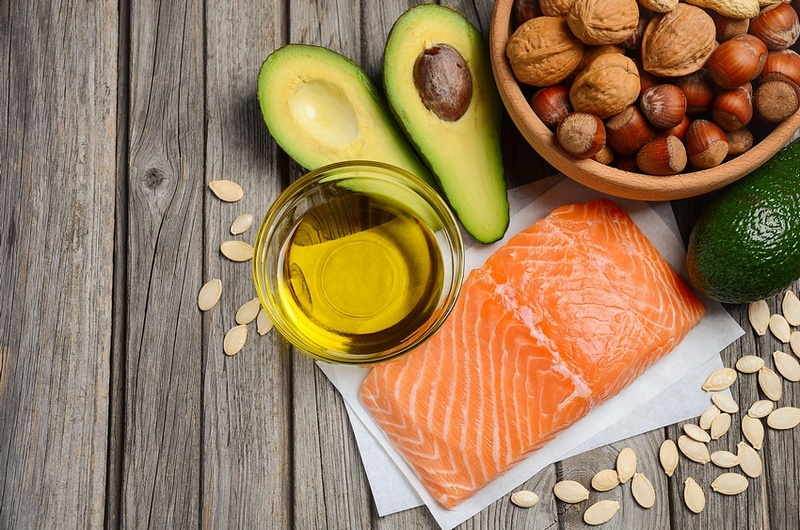 As a rule of thumb, try to let the majority of your fat intake come from monounsaturated and omega 3 fats, especially in their natural forms. Saturated fat should be eaten in moderation or replaced with unsaturated fat, and trans fat avoided where possible. Remember – while we should only take in a limited amount of fat daily, the key is to make sure we choose our fats wisely!